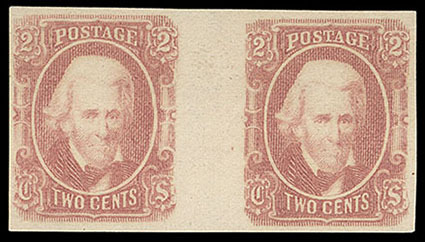 Confederacy, 1863, 2¢ brown red, horizontal gutter pair, o.g., never hinged, full balanced margins, bold color, Choice Very Fine, rare encountered position multiple in never hinged condition; with 2006 P.F. certificate. Scott No. 8 $325 for hinged. 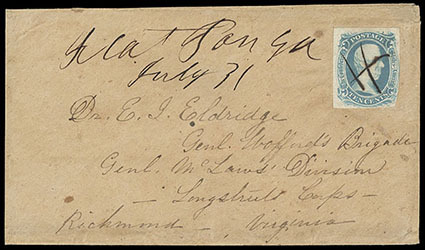 Confederacy, 1863, 10¢ blue, "T-E-N", margins large to touching, manuscript canceled on homemade cover with matching "Flat Pond, Ga., July 31" postmark, addressed to "Dr. E.I. Eldridge, Genl. Wofford's Brigade, Genl. McLaw's Division, Longstreet Corps, Richmond, Virginia", with original enclosure from his wife with some interesting content including mentioning Davis and Battle of Gettysburg, Very Fine, a rare usage from Flat Pond, Ga.
Scott No. 9 Estimate $500 - 750. 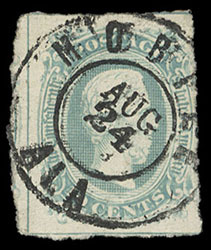 Confederacy, 1863, 10¢ blue, "frame lines", large margins except slightly in at right, full frameline at left and bottom, partial at top, cancelled by bold "Mobile Ala, Aug 24" double-circle datestamp, Very Fine. 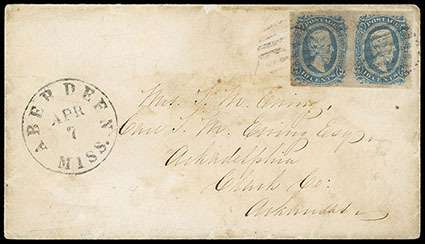 Confederacy, 1863, 10¢ blue, two singles affixed on top of one another as this Confederate Naval cover was used twice, manuscript cancelled & postmarked "Manchester S.C., Oct. 19/ Nov. 7" and sent to Augustine Smythe on the C.S. Palmetto State in Charleston, S.C., flap torn, Very Fine. Scott No. 11 Estimate $400 - 600. Augustine Thomas Smythe served on the CSS Palmetto State as part of the Confederate Signal Corps. Augustine was posted in the steeple of St. Michael's Episcopal Church over looking Charleston, SC. The Palmetto State was an ironclad ram built in January 1862 and joined in the defense of Charleston, during Admiral Samuel Du Pont's unsuccessful attack on the harbor forts, 1-7 April 1863. Palmetto State was burned by the Confederates upon the evacuation of Charleston, SC on 18 February 1865. 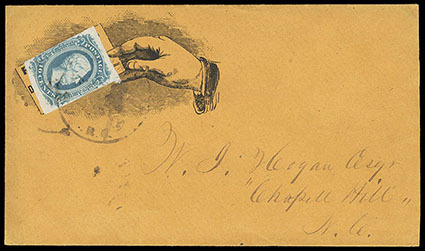 Confederacy, 1863, 10¢ blue, tied by indistinct cds (probably Graham, N.C.) over illustrated Corner Card in Hand, on fresh cover to Chapell Hill, N.C.; cover reduced at right, Very Fine, very unusual; with 1990 P.F. certificate. 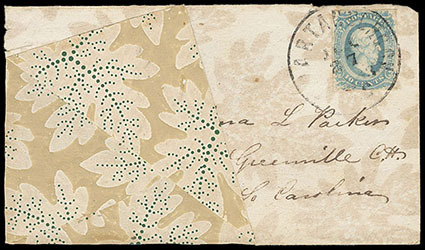 Confederacy, 1863, 10¢ blue, four clear margins, tied by "Spartanburg C.H., S.C." cds on Leaf Wallpaper cover in tan and green, sent to Greenville, Court House, SC., Very Fine and attractive. 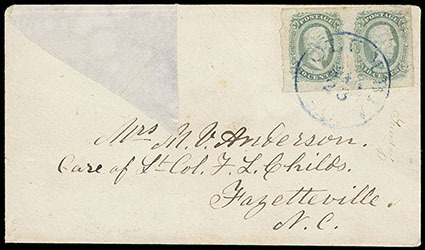 Confederacy, 1863, 10¢ blue, horizontal pair, four large margins, tied by grid cancels on 1864 cover with matching "Aberdeen, Miss, Apr. 7" cds to Arkadelphia, Ark. ; minor soiling affecting stamps and cover not mentioned on cert, F.-V.F. ; with 1986 P.F. & C.S.A. certificates. Confederacy, 1863, 10¢ blue, horizontal pair with huge margins all around, creased between, tied by blue "Columbia S.C., May 23" cds on gray wallpaper cover to Fayetteville N.C.; flap cut for display, fresh and Very Fine. 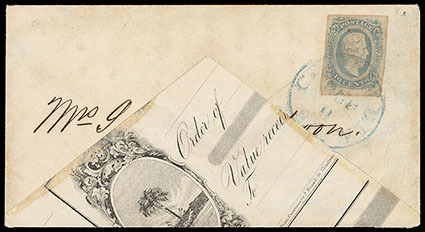 Confederacy, 1863, 10¢ blue, four ample to mostly large margins, tied by blue Columbia, S.C. cds on adversity cover fashioned from an illustrated bank document sent to Yorkville, SC., hint of light aging, Very Fine and attractive. 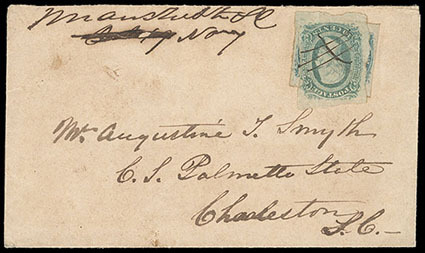 Confederacy, 1863, 10¢ blue, four nice margins, tied by "Charleston S.C., Jul 10, 1863" cds on cover to CSA VP Alexander Stephens in Richmond, Va., then forwarded with boxed handstamp "Forwarded 10" and postmarked "Richmond VA, Jul. 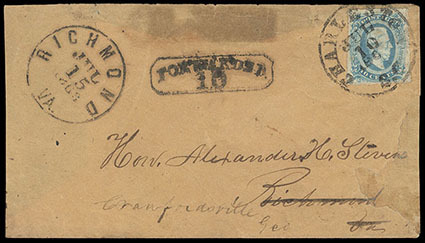 15, 1863" and sent to Alexander Stephens at Crawfordville, Geo., flap missing & cover repair at right with small portion of address added, Fine. Alexander Hamilton Stephens served as Vice President of the Confederate States from 1861 to 1865. In July 1863, Alexander was sent on a peace mission to Washington, DC to see President Lincoln. The peace mission failed as the tide of the War had changed in favor of the United States. Alexander returns home to Crawfordville, GA.
Docketing on verso of cover reads," … S. Lawson, Charleston, SC July 10th 1863. Appeals to Mr. Stephens to hear the sentence of her son commuted who is accused of counterfeiting. ".